a cancer cell where it will do the most damage. ﻿An international team of researchers has developed a drug delivery technique that utilizes graphene strips as "flying carpets" to deliver two anticancer drugs sequentially to cancer cells, with each drug targeting the distinct part of the cell where it will be most effective. The technique was found to perform better than either drug in isolation when tested in a mouse model targeting a human lung cancer tumor. In the study published in Advanced Materials, the researchers attached two drugs - TRAIL and doxorubicin (Dox) - onto graphene strips. Graphene is a two-dimensional sheet of carbon that is only one atom thick. Because TRAIL is most effective when delivered to the external membrane of a cancer cell, while Dox is most effective when delivered to the nucleus, the researchers wanted to deliver the drugs sequentially, with each drug hitting a cancer cell where it will do the most damage. The Dox is physically bound to the graphene due to similarities in the molecular structure of the drug and the graphene. The TRAIL is bound to the surface of the graphene by a chain of amino acids called peptides. These drug-rich graphene strips are introduced into the bloodstream in solution, and then travel through the bloodstream like nanoscale flying carpets. Once in the bloodstream, these flying carpets take advantage of the fact that cancer tumors cause nearby blood vessels to leak by using those leaks to penetrate into the tumor. When the flying carpet comes into contact with a cancer cell, receptors on the surface of the cell latch onto the TRAIL. Meanwhile, enzymes that are common on the surface of cancer cells sever the peptides linking the TRAIL and the graphene. This allows the cell to absorb the Dox-laden graphene and leaves the TRAIL on the surface, where it begins a process to trigger cell death. After the flying carpet is "swallowed" by the cell, the acidic environment inside the cell promotes the separation of the Dox from the graphene - freeing it to attack the nucleus. The researchers tested the flying carpet drug delivery technique in preclinical trials against human lung cancer tumors (cell line A549) in laboratory mice. 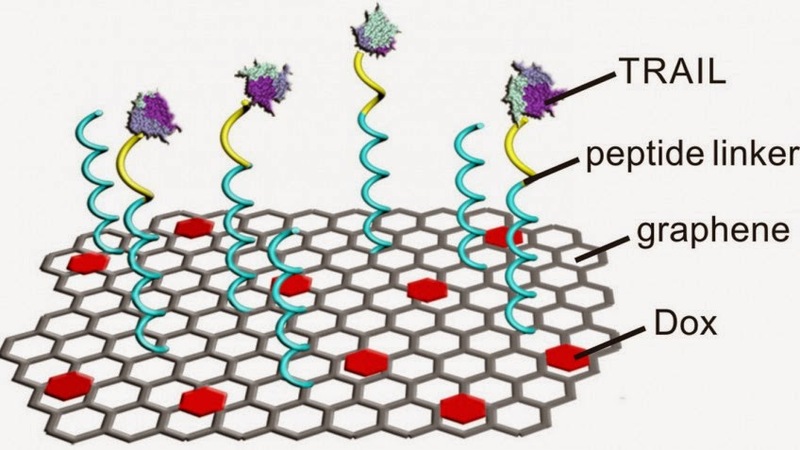 The technique was significantly more effective than Dox or TRAIL by themselves, or to a combination of Dox and TRAIL in which the peptide link between the graphene and the TRAIL couldn't be severed. They are now looking to do additional preclinical studies in order to determine how best to proceed with this new technique. Originally posted by North Carolina State University.